Providing data processing and analysis, litigation support, and records management services. Celerity Consulting Group is an information management consulting firm that provides data processing, litigation support, data analysis, and records management services. Founded in 2001, we are a woman-owned business, certified by the California Public Utilities Commission Supplier Clearinghouse. Celerity clients include Fortune 500 companies, several state attorneys general offices, some of the largest utilities in the country, and 14 of the AmLaw 2016 top 25 law firms. Established in 2001, Celerity is a proven provider, with many senior members of the team possessing 20 years of experience or more. Interview custodians of potentially related data and documentation through site visits, telephone calls, and online surveys. Summarize potential data sources, volumes, and cost impacts. Advise on collection strategies. Perform records inventories. Gather documentation from geographically dispersed locations and ESI from a variety of sources, including Smartphones and tablets, cloud email and storage, enterprise applications, and social media sites. We offer EnCase® Certified Examiners as needed and always use forensically sound techniques to maintain proper chain of custody and avoid spoliation. Help clients find answers hidden within electronic data that typical processing, analysis and review don’t reveal. Specifically, we assist by finding and restoring lost, hidden or damaged files, analyzing operating system and file artifacts to understand user behavior, including file deletion and anti-forensic activity, providing affidavits and expert testimony, and analyzing other forensic expert reports. Process data and documents to extract relevant information and prepare for further analysis and review; efficient litigation support – scanning, image printing, Optical Character Recognition (OCR), electronic file processing, records coding, and database development. Provide data culling and technology-assisted review for eDiscovery matters; extract key business data to support or disprove damage claims or assess class certification; run analyses to shape or construct a damage claim; provide expert testimony, if needed. Offer two options for document hosting and review. 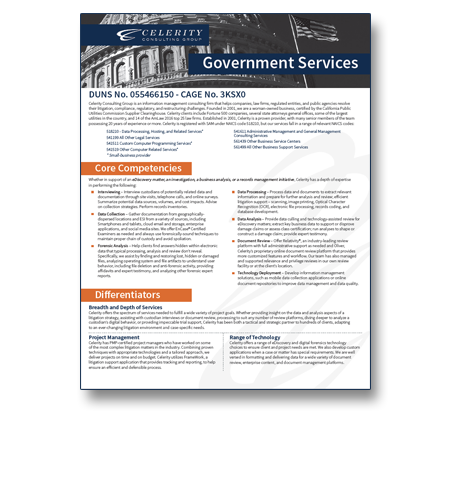 Celerity is a Relativity® Premium Hosting Partner, providing an industry-leading review platform with full administrative support as needed. Oliver is Celerity’s proprietary online document review platform that provides more customized features and workflow. Our team has also managed and supported relevance and privilege reviews in our own review facility or at the client’s location. Developing online information collection and management solutions with a mobile device component to help companies better manage ongoing workflow, such as routine data collection in the field, or temporary programs, such as an environmental remediation effort. Celerity offers the spectrum of services needed to fulfill a wide variety of project goals. Whether it’s providing additional perspective on the data and analysis aspects of a litigation strategy; assisting with custodian interviews or document review; processing to suit any number of review platforms; diving deeper to analyze a custodian’s digital behavior; or providing impeccable trial support and expert witness services, Celerity has been both a tactical and strategic partner to hundreds of clients, adapting to an ever-changing litigation environment and case-specific needs. Celerity has PMP-certified project managers who have worked on some of the largest and most complex litigation matters in the industry. Combining proven project management techniques with appropriate technologies and a tailored approach, we deliver projects on time and on budget. Celerity also utilizes FrameWork, a litigation support project management application that ensures proper workflow, tracking, and reporting, resulting in an efficient and defensible process. Celerity offers a range of eDiscovery and digital forensics technology choices to ensure client and project needs are met. We also develop custom applications when a case or matter has special requirements. We are well versed in formatting and delivering data for a wide variety of document review, enterprise content, and document management platforms.